In a last minute replacement for Shorty Weikel, Xtreme Couture fighter Dennis Davis is going to get a shot at the 145lb Caged Combat title on April 16, 2011. 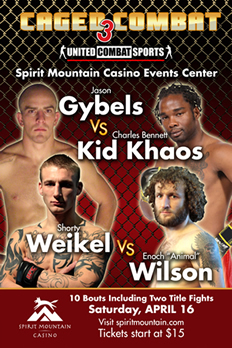 Davis a veteran of over 26 fights will get his chance against Enoch Wilson next Saturday. Shorty boasts a 6-2 record but coming off a loss will have his work cut out for him against the veteran Davis. Davis has a solid back round starting with his experience at Team Quest. Davis began training with Randy Couture, Dan Henderson, and Matt Lindland when Team Quest opened their doors. Davis has kept in fight shape by training and teaching classes at Xtreme Couture. Being from Oregon, Davis will have a strong fan base at the April 16th fight. 8,962 fans filed into the Thomas and Mack Center Friday night to witness “A Night of Combat”. The free night of fights feature Boxing and MMA was the brainchild of UNLV’s Daren Libonati and Banner Promotions’ Art Pelullo. Vegas fight fans were the beneficiaries of gratis tickets and priceless action. Both halves of the card featured tremendous action with warriors that gave their all and laid everything on the line. The live event was tremendous. The Thomas and Mack Center put on awesome video packages, the Nellis Air Force Honor Guard presented the colors while an instrumental version of the Star Spangled Banner played and the packed house sang the verses and fans enjoyed themselves both in their seats and at the top notch bars and restaurants in the Thomas and Mack. Be sure to get there in person the next time UNLV and Banner Promotions team up for an event. Enjoy the MMA fight videos below. Dennis Davis is set to take on Team Quest’s Ian Loveland February 29th at the IFL show in the Orleans Arena. 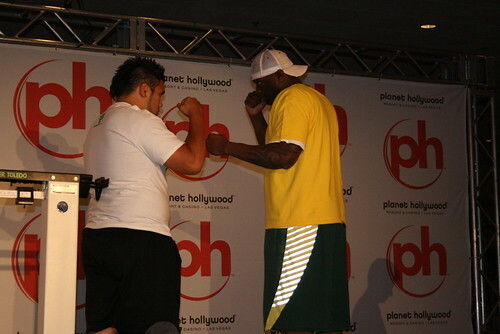 The fight will see Dennis going up against a fighter from his former team. 2008 looks to be a big year for “The Pirahna”. Expect to see him competing for championship belts at 145lbs by mid-year.